Separation Machinery Market size was over USD 84.9 billion in 2017 and is projected to witness gains over 4% CAGR between 2018 and 2024. The separation technology has been consistently responding to global needs and trends. Separation machinery is likely to facilitate industries and individuals to take great leaps forward in an ever-evolving and sustainable world in the future years. By 2024, rapid urbanization especially in the developing countries, will entail the necessitude of the improved infrastructure, water, power, communications and transportation; all of which involve the separation and filtration techniques. Climate variations and natural resource scarcity will make it gradually difficult to source an ever-growing population with clean water. These trends will in turn drive a greater usage of desalination technologies, reuse and recycling of the wastewater on industrial, commercial and consumer scale. Separation machinery market shall observe an upward trend in the near future as all these processes will essentially involve separation technology. The battle to achieve zero discharge and zero emissions in the manufacturing sector, HVAC & environmental applications, transportation, etc. shall be highly technology intensive in the coming decade. Separation equipment is likely to be the set of vital enabling technologies for achieving the desired purification by 2024. Industry giants are likely to tighten their efforts to reclaim and reuse the wastewater in response to intensifying costs involved in the purchase of fresh water as well as the disposal of wastewater. In 2017, only 2% of the 165 billion m3 of wastewater treated throughout the world, was being reused. Management of the urban wastewater and storm water will be highly challenging in the coming years, which will in present a brighter outlook for the separation machinery market. Product life cycles of separation machinery are measured in decades. However, few factors including the high price of equipment, alteration of the end-use industries from developed countries to the emerging countries will present intense challenges for the separation equipment market in the forecast timespan. Industrial centrifuges led the overall separation machinery market in 2017. The segment contributed a massive share above 30% and will observe similar trend over the forecast timespan. Industrial centrifuges involve the application of centrifugal force to separate particles from a solution as per their shape, size, viscosity and density of the medium and the rotor speed. These are certain to observe escalating demand from various end-users including petrochemicals, food & beverages, healthcare and others by 2024. Membrane separators segment is likely to grow with a significant CAGR of about 4.2% by 2024. The increasing product demand will be attributed to the high importance of the product in water purification, desalination and water recovery. Replacement of conventional filtration equipment and the augmented focus on the purity levels of process fluids will be some other factors propelling the market size over the forecast timespan. 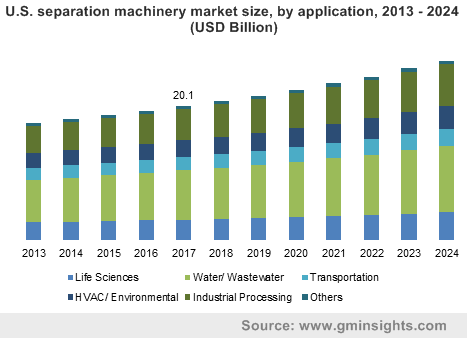 Water & wastewater segment constituted highest share of above 20% in separation machinery market in 2017. Wastewater is full of contaminants including toxic chemicals, bacteria and others. Wastewater treatment aims at lessening the contaminants to tolerable levels to make the water safe for release back into the ecosystem. Manufacturers are probable to utilize the closed-cycle systems in the near future, making the natural water resources environmentally friendlier and safer. Growing government expenditure on wastewater treatment and water utilities, amidst the stringent protocols on wastewater discharge will encourage the technological advancement of the separation equipment by 2024. Life sciences segment particularly led by the food processing and healthcare industries is set to have the highest growth in the coming years. Due to high selectivity, reliability, permeability, and cost-effectivity, demand for separation machinery will witness an upward trend in the healthcare applications by 2024. North America led the global separation equipment market in 2017 with a share as high as 32%. Under the Safe Drinking Water Act (SDWA), EPA regulates drinking water; and storm water and discharges under the requirements of the Clean Water Act (CWA) in the U.S. These acts have set treatment techniques (TTs) and maximum contaminant levels (MCLs) which are essentially met by the drinking water to be considered safe for consumption. The stringent regulatory background is likely to boost the regional separation machinery market size by 2024. Desalination facilities will produce a growing share of drinking water supplies, mainly in arid regions such as the Southwestern U.S., presenting significant growth aspects. Asia Pacific separation equipment market has been estimated to have the highest growth of 4.5% CAGR by 2024. China and India alone will contribute one-third of the growth in urban populations, worldwide. Along with the growth in urbanization and population, these developing countries have been currently experiencing rapid industrialization. The speedy growth of a working class, with the integral demands for goods & services, such as: water and safe food, a reliable power grid and requisite healthcare infrastructure will provide continued growth for the regional separation industry by 2024. Key manufacturers in separation equipment market include: Alfa Laval Corporate AB, ANDRITZ, GEA Group, SWECO, Russell Finex, Mitsubishi Kakoki Kaisha, Ltd., ACS Manufacturing, Inc., CECO Environmental, Gruppo Pieralisi, Ferrum AG, etc. 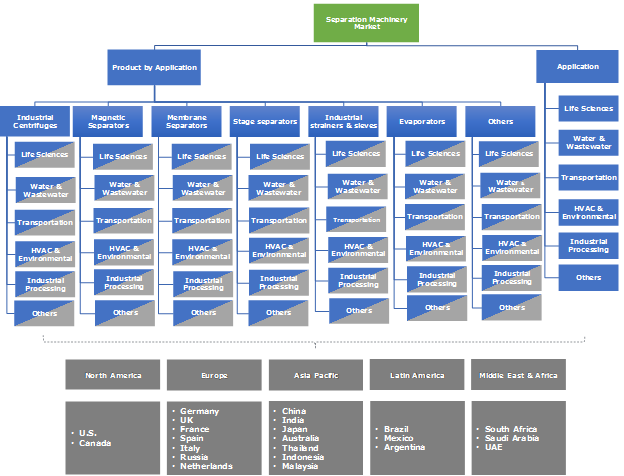 Major separation industry players have the global reach with local manufacturing and supply chains around the globe. Manufacturers are engaged in significant mergers & acquisitions to strengthen their market position. For instance, in April 2018, Ferrum AG acquired Poland based Spomasz-Wronki Grupa to broaden separation technology business. Ferrum added Wronki’s decanters to its existing pusher and scraper centrifuges through the deal. Separation equipment has been the enabler of conversion of a solution or mixture of chemical elements into two or more discrete product mixtures. Various end-use industries including: petrochemicals, food processing, healthcare, wastewater treatment, transportation and others rely on separation technologies to provide cleaner and sustainable solutions. Prevention of ecological concerns surrounding clean water and air supply will drive new technology development promising long term market growth in future. The increased emphasis on a cleaner environment, natural & pure consumables, with the involvement of separation instead of chemical technologies will drive global separation machinery market over the forecast timespan.